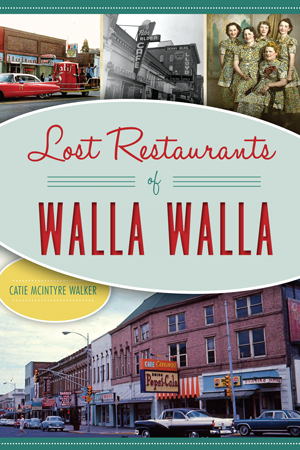 Dining in Walla Walla blossomed from an influx of mining transplants in the late 1800s. Within decades, a roadhouse called the Oasis boasted a seventy-two-ounce slab of beef, and the old Pastime Café opened at 5:30 a.m. with white toast and whiskey for breakfast. In the early 1950s, Ysidro Berrones opened one of the valley's first Mexican restaurants, the El Sombrero Tortilla Factory and Café. Owner of Denney's Hi-Spot for two decades, Joe Denney also satisfied locals with his morning crooning to piano on KTEL. Native and local wine writer Catie McIntyre Walker celebrates this rich heritage with decades of departed, beloved establishments and the people behind them. Catie McIntyre Walker is a native of Walla Walla and the original local wine blogger, known as the “Wild Walla Walla Wine Woman,” since 2005. A graduate of the Institute for Enology and Viticulture at Walla Walla, Catie has written for Walla Walla Lifestyles magazine and various other Northwest lifestyle and wine publications. She is the author of Wines of Walla Walla Valley: A Deep-Rooted History (published by The History Press). Find her blogging at passementaries.blogspot.com and catiemcintyre.com.